570 - Muhammad is born into the Banu Hashim clan, one of Mecca's most important families. His father had already passed away at the time. Muhammad would be raised by a Bedouin family in the desert until his second birthday, as was traditional at the time. 576 - Muhammad's mother Amina dies to ilness, leaving him an orphan. He is placed under the care of his grandfather, and later his uncle. 583 - Muhammad accompanies his uncle to Syria, where he meets a Christian monk who foresees Muhammad's prophethood. 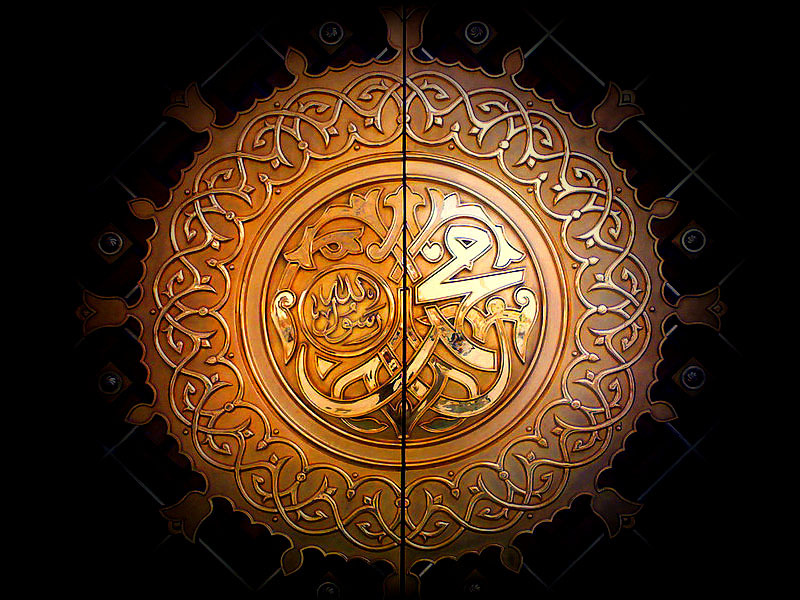 595 - Muhammad marries his first wife Khadijah, a 40-year old widow. 605 - Muhammad is said to have solved a conflict between the clans of Mecca regarding which clan would set the Black Stone in the Kaaba. Muhammad decides that the clan leaders carry the stone together, after which he himself sets the stone. 610 - Archangel Gabriel appears before Muhammad, telling him to start reciting verses of the Quran. Muhammad is distressed by the revelation, fearing he might be possessed. 613 - When the revelations continue after three years, Muhammad is reassured of their divinity, and starts preaching the Quran to the people of Mecca. 614 - Muhammad has gained a small following in Mecca, although not without opposition. A lot of powerful Meccans feel threatened by Muhammad, especially when he starts preaching against idol worship and polytheism. Muhammad and his followers are publicly persecuted in Mecca. 615 - Many early Muslims migrate to Ethiopia, where they form a small colony. They later return to Mecca when the influence of Islam had grown and a few of the high-ranking Meccans had begun converting to Islam. 616 - Two important clans declare a boycott against the Banu Hashim clan, which is protecting Muhammad. This boycott would span three years, during which Muhammad's preaching was very limited. 619 - Both Muhammad's wife and uncle die in the same year. His uncle, who was the leader of the Banu Hashim clan, is succeded by Abu Lahab, who is opposed to Muhammad. Abu Lahab quickly revokes his protection over Muhammad, which leads to Muhammad's search for a new home. 620 - Muhammad goes on a spiritual journey with Gabriel. He is said to have seen heaven and hell on this journey, as well as meeting earlier prophets such as Abraham, Moses and Jesus. 622 - After being warned of an assassination plot against him, Muhammad musters his followers and leaves Mecca for Medina The people of Medina, who are mostly monotheistic themselves, open their arms for Muhammad and his followers. While Muhammad's opposition tried to stop the emigration, almost all Muslims manage to arrive safely in Medina. 624 - Muhammad receives the revelation which tells him to start facing Mecca instead of Jerusalem during prayers. The same year, Muslim warriors under command of Muhammad ambush a Meccan caravan. The Meccans, who were aware of Muhammad's plan, send their own fighting force to accompany their merchants. This leads to the Battle of Badr, which is convincingly won by the Muslims, despite being outnumbered. 625 - Enraged by their earlier defeat, Meccans seek to restore their honour and start sending raiding parties over to Medina. Influenced by younger Muslims, Muhammad decides to meet the raiders in the open field for the brutal Battle of Uhud. This time the Muslims are defeated, suffering great losses; among these losses is Hamza, Muhammad's uncle. 627 - Meccan leader Abu Sufyan lays siege on Medina with a massive force of 10000 men. Muhammad's 3000 defenders employ a new form of defense: digging trenches. Unable to deal with these fortifications, the Meccans are forced to return home after a failed siege of two weeks. Their inability to defeat the Muslims with all their might results in a great loss of prestige for Mecca. 628 - Muhammad commands the first Hajj pilgrimage towards Mecca after seeing a vision about it. Arrived at Mecca, negotiations with Meccan leadership end in a truce between Mecca and the Muslims. 630 - Meccan warriors attack a tribe which was under Muhammad's protection. In response, Muhammad sends a letter with three conditions, telling the Meccans to accept one of them. They take the third option, which means the nullification of the earlier truce. Following this nullification, Muhammad musters 10000 Muslims and marches against Mecca, conquering the city with minimal casualties. Many Meccans convert to Islam, and all images and idols of earlier Arabic Gods are destroyed. 631 - After the conquest of Mecca, Muhammad goes on to conquer the entire Arabian peninsula, completely eradicating all idols and imagery of the Arabian gods. 632 - After conquering all of Arabia, Muhammad completes his first true Islamic pilgrimage, setting precedence for the Muslim tradition of the Hajj. At the end of his pilgrimage, he gives his famous speech at Mount Arafat. Among many things, the speech addresses the equality of all men and the importance of caring for women. A few months after this last speech, Muhammad dies peacefully in the lap of Aisha, his last wife. "Today I have perfected your religion, and completed my favours for you and chosen Islam as a religion for you"
Coded and written by Rosco Kalis. For more information on Muhammad's life, visit his Wikipedia Page.